Just before I left for my summer in NH, I made a somewhat impulsive decision to enter a dress in the Lizzy House Dress Contest. See, I've made four dresses for my daughter out of Lizzy fabrics and obviously I've become a bit obsessed with sewing my Charlotte dresses anyhow- so I felt compelled to make something special for her. Recently I acquired the book Sew Classic Clothes for Girls by Lindsay Wilkes from an LQS. I had never heard of this book before but once I thumbed through its pages, I knew I didn't want to leave the store without it. I chose the Darling Dainty dress as the pattern for this project. I was a little scared to step out of my Oliver and S comfort zone to try a new pattern, but I did okay with the instructions in the book. I only made one alteration in adding interfacing the white collar and hand stitching parts of it to the bodice of the dress, for fear it would stick out a bit from being a bit stiff. I worried that the mini pearl bracelet piping would show through the pale white collar fabric without an extra layer. I wish I had added interfacing to the button placket in the dress, it feels very flimsy back there unfortunately. I've always been attracted to this kind of little girl dress, it's so classic and sweet. I will admit that before I added the butterfly skirt, I worried that the whole thing was looking a bit too patriotic with the color scheme but it works. I am not sure what else I can say about this dress. I just love Lizzy House fabrics SO much- I finally realized I needed to buy at least half yard cuts of her prints because fat quarters just aren't enough. I have noticed that her newest line, The Lovely Hunt, has been disappearing fast and a lot of stores haven't been able to reorder, as the best prints weren't being reprinted. If folks at Andover fabrics are reading this, I would encourage them to not retire her designs so quickly! I don't really know what the rules or criteria are for the Lizzy House dress contest- it was something introduced loosely on IG and the designer's blog. The deadline for entry changed three times, but I managed to finish it in time for the second designated date. We'll see what happens but regardless, I am thrilled with my project and happy that Charlotte loves it so much too. Greetings from southern New Hampshire. Our family just wrapped up a fabulous two week vacation here. We've gone to the beach, Plimouth Plantation, LEGOLAND, and a few other local attractions. I am in heaven being back in New England with the opportunity to visit friends and family. My husband returned to Colorado yesterday (darn day job) but I'm hanging back with the kids for a while longer. I've already made my way to a few of my favorite fabric stores, my adventures there probably merit their own blog post. Just before I left Colorado, I signed up for the "Under the Sea" swap on Instagram and being in coastal New England has already lent itself to a lot of inspiration for that project. I did pack a small suitcase full of a few projects to work on while I am here, but as expected, sewing time and opportunity is proving to be scarce so far. June and July will probably not be filled with much blogging especially, so please pardon my absence here. For the first time ever, I made a scrappy exterior instead of just using a plain piece of fabric. 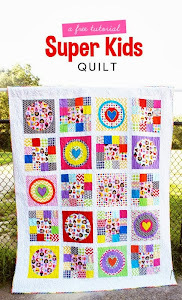 It took me a while to decide how I wanted to design the outside but I finally settled on simple patchwork squares. I also decided to go extra scrappy by using six different fabrics for the bindings and tab ends. Thanks for reading. I have one more pre-summer project to document, I'll be back soon! 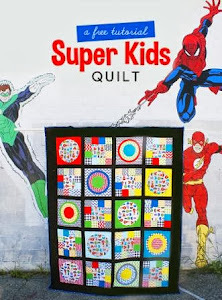 Linking up with Scraptastic Tuesday with She Can Quilt and Mrs Sew and Sow.